Brooklyn Botanic Garden Wedding Photography offers images of scenes that could have been pulled from a fairytale. The Brooklyn Botanic Garden feels miles away from city life, but is actually in the heart of one of the most renowned cities in the world. Set in Brooklyn, New York, the Brooklyn Botanic Garden gives couples and their guests the feeling that they have stepped through a magic doorway into another land, not unlike Alice falling into Wonderland or Dorothy waking up in Oz. The Brooklyn Botanic Garden Wedding Photography from this particular celebration gives that feeling as well. 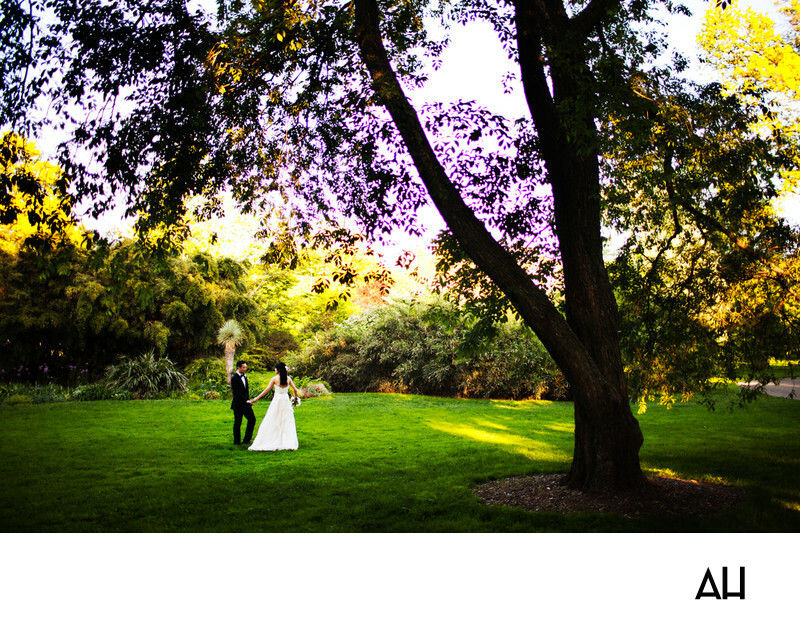 The image shows the bride and groom enjoying a moment together amidst the vibrant flora of the gardens. I took the image from afar, giving the newlyweds space to be candid and an opportunity to be somewhat alone. The pair stand in the lush green grass, surrounded by the immense natural beauty of the venue. In the picture, the bride reaches her hand out for the groom to take so that they can continue to walk about the grounds with fingers intertwined. He smiles at her adoringly and light dances around them as it filters through the branches of the large tree that rises up a few feet away. The tree’s branches reach out above the couple and into the heavenly light that fills the sky. That light, combined with the shadows created by the tree, make its leaves appear in such a variety of colors and hues that it could be an image from a painting. Many of the leaves appear in shades of green, while others look yellow or gold, and some even seem to be purple -- a strange result of shadow mixed with pure sunlight. The scene is breath-taking and it gives the bride and groom an image to cherish from their very own magical story.